In this litigious, politically-correct society that we live in, a person can be sued for just about any frivolous reason. It is important that we think our decision to carry a concealed weapon through very thoroughly, as we have all heard the stories about how a law-abiding gun owner used his gun to defend his family but was arrested and sentenced. One thing we can do to help protect ourselves in the event that we have to shoot in self-defense involves the possibility of obtaining concealed carry insurance. Let me define what I mean by “self-defense insurance” – I am simply talking about signing up with a company or organization that covers you legally in case you have to shoot someone in self-defense and helps with your expenses. There are other services these groups provide, but that one is the focal point of their efforts. I Just Shot Someone… Now What?!? We have all read or heard about the person who has to pull his or her gun to defend themselves or their loved ones only to be arrested, taken to jail and then court. They are treated like the perpetrator, not the victim and must go overboard to prove their innocence. And, to add insult to injury, after it’s all said and done, it may take months to get their gun back from when the police seized it as evidence. There have been some cases I’ve read about where the gun is never returned. Before The Police Arrive – what do you do in the immediate aftermath, right after a shooting? Do you call the police and/or 911? What about your gun? Holster it or not? When The Police Arrive – How will they know that you’re the “good guy”? Do you tell them everything that happened? What if they arrest you? At The Police Station – What if they book you and put you in a cell? What information do you divulge? Suppose they arrest you and the next step is court…what about bail? How do you get your gun back that they’ve taken as evidence? At The Preliminary Hearing – Should your lawyer be present for this formality? How do you plead? (If It Goes That Far), At The Hearing – Hopefully by now things have been straightened out but what happens if that’s not the case? Is your lawyer “up” on self-defense laws and tactics? There is a lot more to a self-defense shooting than you might imagine. The legal waters that you must navigate are murky and sometimes dangerous, if you are not prepared. That’s where these organizations come in – they are there to help you. Even if you are acquitted and released, you will still have many thousands of dollars of legal fees after a (most probably) length trial. Here’s where these types of organizations can help you. They will, in varying degrees, help with your legal defense and expenses (the groups will help with expenses to varying degrees). Some offer other services such as help with training and equipment selection. All CCW self-defense companies are not created equally, however…some are better than others at protecting you. Let’s look at these five organizations and do a little comparing of services. We’ll look at costs and coverage, and any other pertinent information that might help you decide whether to join one of these or not. At least you’ll get a basic understanding of how each group works. It’s hard to make a chart with categories that show how each group covers events and costs, so I’ll just list the major points. If you want more detailed information, please visit the groups’ websites. Also, as Mas Ayoob states above, read the fine print. There are differences between the groups’ coverages. Notice the comprehensive services they provide. You and I may not even consider that we might need money up front for bail – they provide it. They even provide a per diem reimbursement for the time you spend in court. 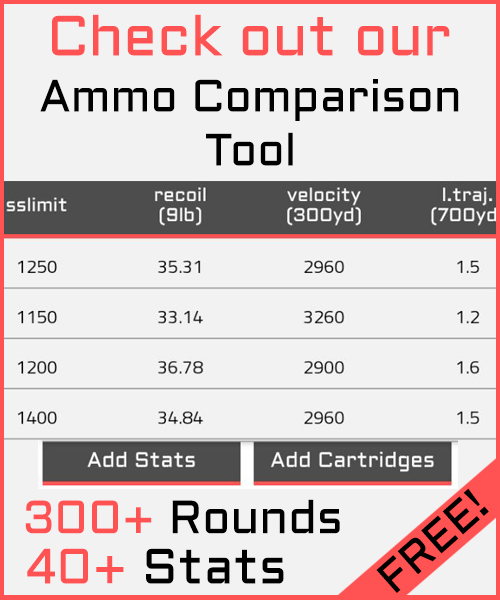 Is The USCCA Worth It? 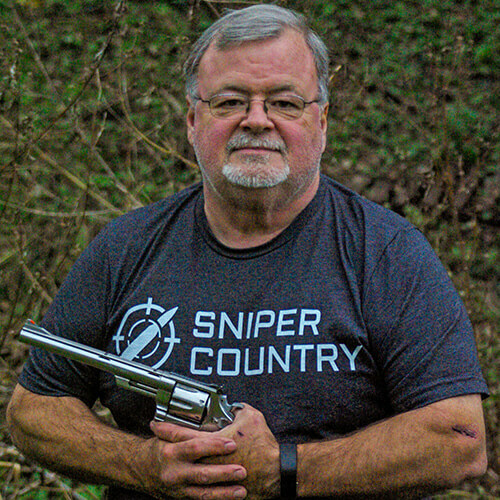 Does the USCCA deliver on its promises to help you in the event of a defensive shooting? Is it really on the up & up? Well, according to the Better Business Bureau they have an “A+” rating, so they’re doing something right, to be sure. The USCCA has some strong points: they aren’t just about legal protection but put a strong focus on training and related gun-owner skills. They also help you know the specific gun laws of your state. They will cover your up-front costs and will cover you for any type of legal weapon, not just firearms. Testimonials abound, with several on their website but I like to bypass what is obviously going to be good news and try to dig a little deeper into forums, unsolicited reviews, etc. Try as I might, I found very few negative comments about the USCCA – most of the folks who are members are seemingly happy with their situation. I only found 2 remotely-negative comments on the BBB site, and those had to do with not receiving emails after a move and a membership issue. It seems that the USCCA is for real and has the membership to prove it. This organizations receives its funding from four sources: Dues Allocation, Corporate Donations, Bequests and Personal Donations. They are not as specific as to exact amounts they will pay out but they seem to be well-respected in the gun community. The monetary pay-outs are not quite on a par with those of the USCCA, but the ACLDN excels at training and delivers a lot of helpful information concerning your rights in relationship to a justified shooting. There are add-ons that you can buy in addition to the coverages above – they include gunowner ID Theft for $6.95/month or $83.40/year and minor children coverage for $2.00/month or $24.00/year. For $2.95 per month or $35.40 per year, members can receive the legal benefits that they are accorded in their home state while traveling in other states plus Washington, D.C. with the Multi-State Protection Plan. The program covers accidental discharges. I think that’s a great idea. You don’t have to shoot someone to be covered. In some states, just showing a weapon in order to cause a bad guy to back off is a crime. With this program, that would be covered. Another great idea! Is The Shield Worth It? You use a gun in a shooting of a current or former family member (or dating relationship). So, if you are OK with the limitations, check out the U.S. Law Shield. The fourth group is the NRA Carry Guard. The NRA is nothing if not thorough in its involvement with firearms and related activities. In 2017, they launched their version of concealed carry/self-defense resources, but like so many things they do, it encompasses more than just concealed carry insurance. 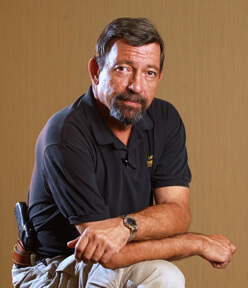 When you go to their website, you are inundated with graphics and information about training options, videos, resources of all types…and a free seven-page .PDF brochure that you can download called “The Aftermath” that tells you what to expect after a self-defense shooting, from the time the police arrive to what happens to your gun to what happens in court. It’s definitely worth a look. There are a few differences between Carry Guard insurance and some others … your spouse is covered at no additional charge, for example. 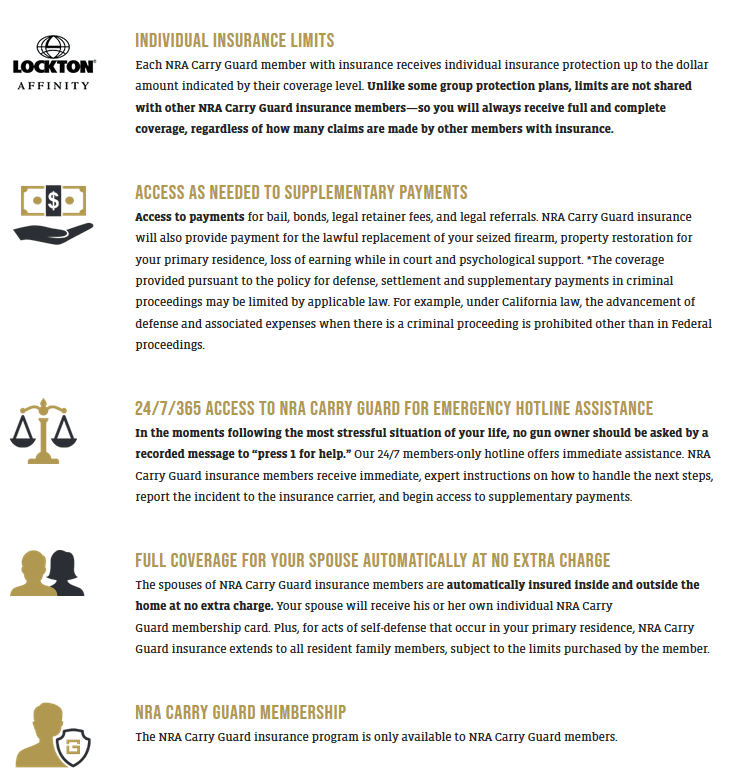 The insurance component is new for Carry Guard, as before it was largely not available. N.R.A. Carry Guard has always been a leader in training and related resources, and now they’ve added actual coverage for members. Carry Guard has many training resources including videos and where to go to attend live training classes. They are interested in developing leaders and have information about firearms instructors (and how to be an instructor). News items concerning such topics as pepper spray, calibers, reholstering, etc. are to found here as well. The information offered is well worth a look. The NRA’s approach is, first, how to avoid a deadly situation and secondly, what to do if you are involved in one – that’s where the training comes in. If you are an NRA member, you are probably swamped with offers from them – I know I get a lot – but this is one service they provide that you might want to check out. The Ultimate Plan is an annual membership and coverage is good for one year with automatic renewal. Some of the restrictions are notable – what if a “chemically-altered” (read: high) distant family relative drives to your town, looks you up and demands the “money you owe me” at knife-point? You barely recognize him but your life is in danger – if you shoot him this group will not cover you according to their Restrictions. Another point…even if he is not related, if you let him into your house, you’re not covered. Again, read the fine print and the Terms of Service. Protector, starting at $149 per year for active or retired law enforcement or military with a CCW permit. The coverage is identical to that at the Defender level with one change: spouse and children under 18 are covered in your home only. You can add your spouse for $100, $1,000,000 bail coverage for $50, and $1,000,000 dedicated civil liability for $220. These Plans Are For Permit Holders. I Don’t Have A Permit-Can I Be Covered? So, you can be covered in your home even if you don’t have a state-issued permit. This is a good idea, as some plans can be more limited in their coverage when you are in your home. Notice it covers events such as robbery and burglary – if you feel your life is in danger regardless of the reason, the plan should cover you. Obviously, if you use deadly force against a person who is just in your home but doesn’t pose a threat, you might be standing on some thin ice. Check with your local law enforcement agency to clarify your rights. on-duty incident coverage – peace officers, etc. Church security team – the only plan that covers a specified volunteer church security team member is the Ultimate Plan. Other plans do not cover this situation. So, can you be covered if you carry in church and have to use your gun but are not on a security team? Yes – there is one way. The way I read it is that if you are carrying a concealed gun and are in church but are not officially a member of a security team and you have to use it, you are covered if you have any of their coverage plans. If you’re going to be a designated member of a volunteer church security team, in order to be covered you must upgrade to the Ultimate Plan. Another point to consider is that it states in the Terms & Conditions that this is a “Services Agreement”, not insurance, so you should still be able to draw on your own insurance provider’s coverage. So you see, there are several organizations out there who want to protect you in the event of a self-defense shooting…it’s just that they vary in their philosophies and coverages. I would want to know that, in the event of a shooting, I would have every available resource at my side that my organization offers and that they would basically “drop everything” and get there to help me as soon as I call them. I will not recommend one of these groups over another – that’s for you to decide – but we will look at one of them in more detail in a future article. If you have any questions about any of these groups, look at their website and call them – they will be happy to help you. With our society in the state that it’s in today, maybe a call to one of these groups may not be a bad idea! 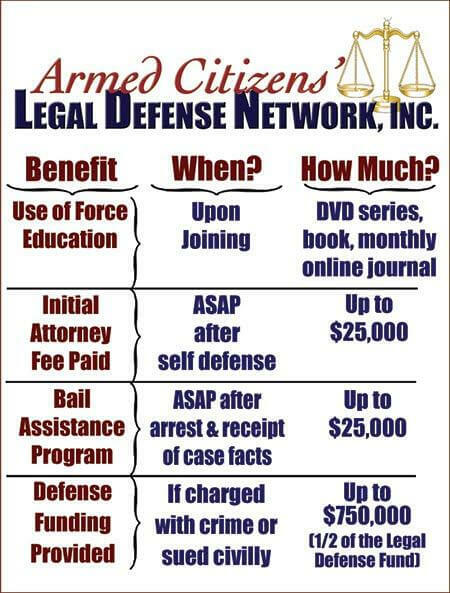 If these are considered “Legal Defense Services” can one belong to more than one and receive services from multiple companies at the time of need? This would be in direct opposition to insurance companies which do not allow multiple company payouts. If one can use multiple, I would suggest that is VERY beneficial – receiving multiple payouts, but more importantly, creating a “specialized” service. Very interesting question. Unfortunately we don’t have an answer for you at the moment. When we know more we’ll update this part.